Sheep farmers are being encouraged to make use of the latest technology to boost the genetics and profitability of their flocks. A demonstration of Computed Tomography (CT) scanning of ram lambs will take place in Aberystwyth on Sunday 28 August, in order to show how the technology can accurately measure key characteristics to help produce lambs which meet market requirements. The mobile scanner, which is owned by Scottish agricultural college SRUC and is being demonstrated in Wales in collaboration with Hybu Cig Cymru – Meat Promotion Wales (HCC), will be at the University farm, Plas Gogerddan, Aberystwyth, SY23 3EB. CT scanning can help to identify outstanding animals within the breed, and can improve the efficiency with which superior animals can be selected using on-farm ultrasound. Gwawr Parry, HCC’s Industry Development Officer, explained the various data that the CT scan generates. "The scan produces measurements for the weight and the percentage of fat, muscle and bone in the carcase. "Data can also be obtained on muscle distribution in the loin, leg and chest." "With processors paying more for animals with certain characteristics which aren’t always obvious to the naked eye, analysing breeding rams is becoming ever more important for farms’ profitability," added Gwawr. 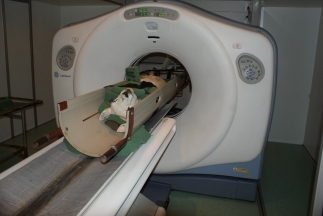 "CT scanning is a welfare-friendly way of obtaining key data to improve Estimated Breeding Values; I’m sure many will be keen to see this technology in action." Any sheep breeders who are interested in viewing the demonstration are encouraged to contact HCC on 01970 62 5050.